The latest matchups in the BVI Football Association’s Primary School League saw Bregado Flax Educational Centre’s Under-7 squad land a one-nil victory over the Enid/Althea Scatliffe Primary joint Under-7 team. Young Liam Munn was the lone goal-scorer of the match. In the Under-9 category, Alexandrina Maduro Primary School (AMPS) bagged a 2-1 victory over Cedar School. AMPS’ Jaheim Bijai was the first to score before Blake Kirk equalized for Cedar. Elijah Maduro then responded with the second goal for AMPS. Cedar’s star player, the young Blake further demonstrated his athletic potential when he scored all four goals during his school’s 4-0 matchup with First Impressions. There was also another nil-all result when Althea Scatliffe Primary’s Under-9 squad went head-to-head with Robinson O’Neal Memorial Primary. During Under-12 matches of the league, Cedar School claimed victory over Joyce Samuel Primary with an impressive six-goal victory. Cedar’s Dylan Kline netted three of those goals, while his teammates Ryan Lettsome and Oli Henderson scored two and one goals, respectively. AMPS’ Under-12 team drew 1-1 with the Willard Wheatley/Francis Lettsome Primary School (WWPS/FLPS) joint squad. WWPS/FLPS also drew 0-0 with Althea Scatliffe’s Under-12 team. Elsewhere, Lewis Munn grabbed a hat-trick for Cedar in their 5-0 victory over First Impressions. Dylan Kline and Niki Haycraft were the other two Cedar players who scored one goal each in that match. 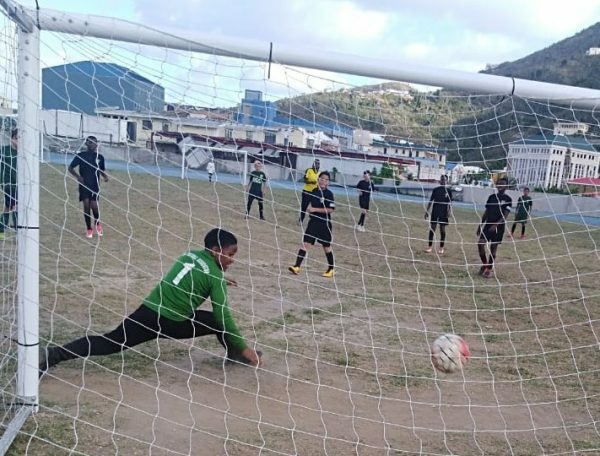 Bregado Flax’s Under-12 squad put on a stellar performance when they defeated Joyce Samuel Primary 4-nil. Andres Bailey scored twice while Joel Mars and Jaden Abrams each scored once.